And now, on to our Saturday shows…. and note that, after the shows, there’s a little bit more. Suffice it to say it is a tribute to 140, or perhaps a bit more, characters. In perhaps one of the first recorded pieces of theater in the Western canon that passes the Bechdel test, Euripides’ Trojan Women tells a story of women who are stronger than gods. Trojan Women offers an unapologetic and powerful look at the act of community-building during times of grief, the gendered violence of war, and the messy aftermath of both real and mythic Greek conquests. Written circa 415 BCE and set immediately after the Trojan War, Trojan Women follows in real time the lives of nine remaining Trojan women (and two Greek men) as their city is captured. Well before the story in the play started, the Gods had a party on Mt. Olympus. They chose to not invite Eris, the Goddess of Discord, perhaps because they felt she would ruin the vibe. Angered by this slight, Eris devised a way to ensure that she ruined their night. She threw a golden apple (known always after as The Apple of Discord) on which she had inscribed “to the fairest” into the party. Naturally, Hera (Goddess of Women), Aphrodite (Goddess of Love) and Athena (Goddess of Wisdom and War) each assumed the apple was for them. A fight ensued, and the three goddesses demanded that Zeus determine which of them was the fairest and deserved the apple. Knowing better than to get in the middle of this argument, Zeus suggested that Paris of Troy, a mortal he knew to have good judgement, should make the call. Each Goddess promised something different to Paris if he chose her: Hera promised immense power, Athena promised incredible strength, and Aphrodite promised the love of the most beautiful woman in the world. Paris chose Aphrodite, and thus, the love of Helen was promised to him. The events that followed, and why they occurred, are still up to interpretation. We know Paris visited Greece while Greece and Troy were on good terms, and we know that Helen left her husband, Menelaus, and got on Paris’ boat headed back to Troy. Upon hearing that Helen was gone, Menelaus approached his brother Agamemnon, and they decided to wage war on Troy. This war lasted for ten years, and ended with Odysseus’ Trojan Horse. Greek soldiers hid inside a giant steel steed, which they had presented as a “Congrats on winning the war” present. In the middle of the night, while the Trojans celebrated what they thought was a victory, the Greek soldiers crept out of the horse, unlocked the gates of Troy for the rest of the soldiers who were waiting, and sacked the city. During that night, Paris died. Priam, King of Troy, died. Hector, Troy’s most steady and masterful warrior, had died days earlier. Almost all of the city is killed or enslaved. Left behind are only the Trojan Women. And Helen. This play, which was the third part of a trilogy about the Trojan War by the Greek playwright Euripides, opens on a war camp in Troy after the Trojans have already lost to the Greeks. What follows is detailed well in the Wikipedia synopsis; you may find the story harder to follow on stage (I did) due to unfamiliarity with the backstory and the style of language used. Here’s the essence: The play follows the fates of the women of Troy after their city has been sacked, their husbands killed, and as they and their remaining families are about to be taken away as slaves. The focus is on how much the Trojan women have suffered as their grief is compounded when the Greeks dole out additional deaths and divide their shares of women. Through out play, a Greek herald, Talthybius, arrives to tell the women their fates. This includes the fact that the dethroned queen Hecuba will be taken away with the Greek general Odysseus, and Cassandra is destined to become the conquering general Agamemnon’s concubine. Cassandra, who can see the future, is morbidly delighted by this news: she sees that when they arrive in Argos, her new master’s embittered wife Clytemnestra will kill both her and her new master. However, Cassandra is also cursed so that her visions of the future are never believed, and she is carried off. From the widowed princess Andromache, wife of Hecuba’s late son Hector, Hecuba learns from her that her youngest daughter, Polyxena, has been killed as a sacrifice at the tomb of the Greek warrior Achilles. Andromache’s lot is to be the concubine of Achilles’ son Neoptolemus, and Andromache’s her baby son, Astyanax, has been condemned to die. Helen, who started this mess although not one of the Trojan women, is supposed to suffer greatly as well: Menelaus arrives to take her back to Greece with him where a death sentence awaits her. Helen begs and tries to seduce her husband into sparing her life. Menelaus remains resolved to kill her. Near the end of the play, Talthybius returns, carrying with him the body of little Astyanax on Hector’s shield. Andromache’s wish had been to bury her child herself, performing the proper rituals according to Trojan ways, but her ship had already departed. Talthybius gives the corpse to Hecuba, who prepares the body of her grandson for burial before they are finally taken off with Odysseus. Much of the play is the women bemoaning what they have lost. This is an ambitious play for a Fringe company to mount; I know the Santa Clarita Shakespeare Company is doing it for one weekend in July at the site formerly known as REP East. Luckily, Project Nongenue succeeded: the production was excellent. Even if you can’t follow the specifics of the story well, you can get the gist of the performances. And those performances? Just “wow”. Moving and beautiful, clearly demonstrating the anguish that these women were going through. Director Olivia Buntaine (FB), assisted by Elizabeth Jane Birmingham (FB), with movement direction by Christine Breihan (FB), have worked with the performance ensemble to create nothing less than a work of art. Leading the performance team, at least in my book were Kay Capasso (FB) as Eris, who narrated the events, and Taylor Jackson Ross (FB) as the former queen, Hecuba. Ross draws your eyes; I found myself unable to keep my focus off of her when she was involved in the main action. Capasso, on the other hand, is always swooping around, narrating the action and providing sardonic commentary. Both were great. The main cohort of women in the camp with Hecuba were Liz Eldridge (FB) as Leader; Elizabeth Jane Birmingham (FB) as Iris, and Avrielle Corti (FB) as Zosime. All gave strong performance, although the version of the story didn’t allow the audience to learn that much about them individually and as characters. Popping in and out of the proceedings, either as Talthybius the messenger, or as Menelaus, Helen’s husband, was Cameron Rose (FB). He had the unenviable job of (a) being the only man in the company, and (b) being the bearer of bad news. He handled both well. The remaining characters generally came in for a scene or two, advanced their storylines, and departed: Kyra Morling as Cassandra, Celia Mandela (FB) as Andromarche, and Daphne Gabriel (FB) as Helen. All had strong performances; I particularly likes Gabriel’s Helen, and Morling’s Cassandra. The production design of the show was simple: essentially clotheslines with cloth screens and some ladders, with a few props and use of fabric to represent the baby Astyanax. This design was by Cameron Rose (FB). It was supported by Leslie Rose (FB)’s lighting design, and Rich Rose (FB)’s scenic consultation. Costumes were by Elizabeth Jane Birmingham (FB). Robert Arthur Angell (FB) provided Dramaturgy. Al Washburn (FB) did the graphic/web design. Backstage drums by Robert Arthur Angell (FB) and Al Washburn (FB). The production was produced by Robert Arthur Angell (FB). No credit was provided with respect to the translation of the Greek playwright Euripides, or who adapted it for the Fringe stage and time limits. As I write this, there is one more performance of Trojan Women: June 22 at 8pm. Actor/musician, Jeremy Ebenstein, through story and song, takes audiences through his humorous, inspiring, yet often heartbreaking story of living a life with Asperger’s Syndrome. With eight original songs and compositions, Ebenstein chronicles his journey from childhood to adulthood, addressing universal issues like childhood bullying, hopeful romance, and overcoming depression, to his unique take on the struggles of everyday life, from relationships, to being able to hold down the simplest of jobs, yet always striving towards his dreams of being accepted and living a successful life. It’s a story of hope and love, not only for those suffering with Asperger’s Syndrome, who need to overcome the additional challenges that Asperger’s presents, but for all who have ever hoped and dreamed about making something of themselves. Given that we work with engineers every day, are engineers ourselves, and know numerous folks on the spectrum, this show seemed to hit home. So we decided to see it. In general, Jeremy Ebenstein (FB) does a good job. His story is moving, and it takes a lot of courage — especially for an Aspie — to get up on stage and tell it. It could use with a bit of editing — at times, it seemed to drag and one had to fight the urge to look at the cell phone for the time. But I view that as a side effect of the Aspie desire to tell too much information; I urge the directing and advising team to see if perhaps ten minutes might be cut — some repetitive examples, perhaps some of the approaches. However, overall, the ultimate story told by Ebenstein was good. It captured well the difficulties for someone on the spectrum to achieve in the dramatic field. The stories of him in school, and his attempts at forming relationships, were quite good. Luckily, Ebenstein found his music — music is a wonderful too to help people get through so much. His rendition of “Over The Rainbow” during the show was astounding; his other songs were good, although a bit less memorable. The script for the show was developed by Ebenstein with Jack Fry (FB) in the Jack Fry Solo Workshops. Direction was by Jack Fry (FB) . I’ll note that we’ve seen Fry on stage before, at HFF16, as EInstein. Debra Ehrhardt (FB) served as producer and creative consultant. There is one more performance of Pain in my Asperger’s : 6/20 at 7:45PM. After the show, we had one more stop to make: we had to see the Donald Trump Presidential Library. 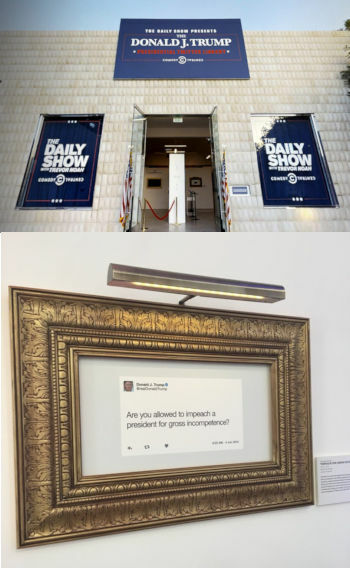 To be more specific, it was the pop-up installation of The Daily Show Presents: The Donald J. Trump Presidential Twitter Library in West Hollywood (it was there last weekend and this weekend; today is the last day). This museum is dedicated to preserving Donald Trump’s favorite medium of communication: the tweet. The website has a virtual tour, but there are areas devoted to all aspects of his tweets: the people he mentions and disparages, his history of tweeting, the story of how he has used his tweets for good or bad; how he has tweeted about foreign countries, and so forth. In some ways, this is serious. All Presidential Communications are part of the national archives, and his tweets are being saved in the National Archives. So this is probably the first … perhaps scholarly is too strong … study of these Presidential records. They paint a picture of a man with too much time on his hands … a man who spends too much time on a gold-plated throne … a man who watches far too much “Fox and Friends” … a man who prefers to take his constantly changing and contradictory messages directly to the medium in pre-packaged mouth-sized soundbites. Seriously, the exhibit was a hoot. It really shows who the man is, which is the point of these archives. Expect future archives of the ripped-up but later reassembled papers received in the Oval Office. Probably with the President’s scribbles annotations on them. Plus, when you go the library, you get your own “Donald Trump Twitter Name”. I was “Oily Dan”. The Daily Show Presents: The Donald J. Trump Presidential Twitter Library continues in West Hollywood, at 631 N Robertson, until 10pm today.